Matthew Malcolm wonders, “Was Paul Faking ‘the Weak’?” in I Cor 8-10. This entertains David Garland’s suggestion that I Cor 8-10 doesn’t advise what is usually assumed — that the “strong” should restrain their freedom for the sake of the “weak” — but rather that any association with idols is off-limits for Christians period. The “weak” didn’t exist, according to Garland; they served as a hypothetical construct for Paul’s point that idolatry should be avoided at all costs. • By chapter 10, Paul’s argument – which started off gently by using the hypothetical example of weak brothers – becomes emphatic and uncompromising: Flee idolatry! Mark Nanos has made similar points, but not to show that the weak didn’t exist. They existed in large numbers: they were non-Christian outsiders. On this line of thinking, Paul’s concern is not that the weak will revert to idolatry out of any supposed insecurity, but that they will never turn away from it. This naturally plays into the next point, that Paul is in fact urging Christians to avoid idolatry in chapter 8 as much as chapter 10. But again, contra Garland, the weak refer to pagans who stand as potential converts. (For that’s what defines a pagan: they eat idol meat without any qualms; that’s why they’re weak.) Once we see this, we needn’t suppose that Paul was “faking” the weak. With Malcolm in the end, we should regard the essential point of I Cor 8 being that the strong should restrain themselves for the sake of a real group of others. But those others were predominantly unbelievers — pagans whom Paul fears would get wrong ideas if they saw Christians exercising their freedoms indiscriminately. Such behavior would give potential converts the idea that Christianity was a syncrestic religion (that they could simply add Yahweh/Christ to their own pantheon), or alternatively, make Christians look like hypocrites who don’t really believe in the exclusivist claims they preach. As in Rom 14-15, Paul urged Christians to forsake their freedoms in the company of outsiders in order to win them to the gospel efficiently. As Mark Goodacre has noted, N.T. Wrong’s blog is now password protected, and I’m sure this had a lot to do with it. But Wrong’s maneuver could be an act of subterfuge — I mean, we know his first death was followed by a resurrection. Mark wonders if another one is on the way, and I’m betting so, for greater things down the road. The anti-bishop has too much up his sleeve to stay buried underground. Now this is stirring the pot. N.T. Wrong has taken the initiative to pull together the thirty-seventh Biblical Studies Carnival which never got done for the month of December. 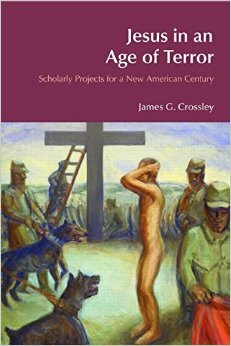 One highlight that he mentions is James Crossley’s new book, Jesus in An Age of Terror, which I’ve read, though note that it’s currently unavailable in the U.S. (amazon.com and Baker & Taylor still list the inaccurate Dec ’08 release date). UPDATE: Since Wrong has closed his blog, the carnival is moved to Jim West’s. Bloggers are intimately familiar with hobby-horse commenters, and for some time I’ve been meaning to single out a few for honorary notice. Yesterday’s developments in the comments under James Crossley’s latest post convinced me it was time to do this. The following are the top three hobby-horse kings of the biblioblogosphere, those who enjoy pushing their pet theories at every possible opportunity (even when the subject is off-topic), to the near exclusion of other interests. Each authors a blog. And each has left zillions of comments (only a few are showcased below) on many different blogs, as if redundant repetition will earn as much respect as the attention they attract. (1) Geoff Hudson. Hobby-Horses: Everyone under the sun is Jeffrey B. Gibson in disguise. Various conspiracy theories involving the reworking of Paul’s letters (see the many comments consolidated under one post), which were originally about purifying the temple of animal sacrifices. Almost everywhere in biblioblogdom, Hudson leaves piles of repetitive and confusing comments, usually in dialogue with himself as much as others. He earns the top slot for sheer volume. (3) Steven Carr. Hobby-Horse: Paul denied that Jesus’ corpse was raised from the dead. See further here, here, here, and here (all in comments) for redundantly predictable restatements. To be fair, I don’t think Carr is entirely wrong insofar as what he argues against, only that he doesn’t allow for more ambiguity and tension in the Pauline view of the resurrection. I want to offer congratulations to our Hobby-Horse Kings for an unrelenting perseverance, and for holding their ground in the face of so much mainstream ignorance. Yes, and Stephen Carlson is going to be the editor of this ambitious, amorous project.